This an update of a Body Hair Transplant patient for Dr. Umar. This is the 3rd video installment of his progress. It is now 3 years since he had his first surgery with Dr. Umar at Dermhair Clinic. Due to his failed hair restoration procedures in the past, such a repair case could not have been possible with a “strip” procedure. This an update of a Body Hair Transplant patient of Dr. Umar. This is the 3rd video installment of his progress. It is now 3 years since he had his first surgery with Dr. Umar at Dermhair Clinic. Due to his failed hair restoration procedures and exhausted head donor supply (See pictures) before seeing Dr Umar, such a repair case could not have been possible with a “strip” hair transplant (FUT or FUHT) procedure. 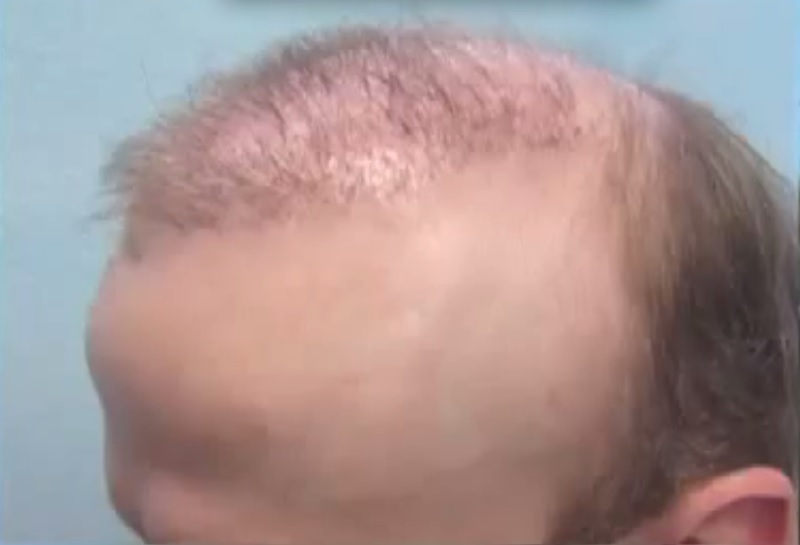 At the time of shooting this video, this patient is reputed to be the worst documented hair transplant repair case ever completed successfully. This video highlights his transformation at 36 months after his initial repair work performed by Dr. Umar in Los Angeles. Part 3/3 of the patient’s video series. To put this in the context of the last decade, it is bloody amazing!!! amazing work nd great outcome…brilliant!! This is the greatest repair ever in this history of repair, and furthermore, it shows that anything is possible when you see this. Wow, what a remarkable job. For all the Wow- This is an old repost. Why not show at least 5 guys with these type of results. Results vary. Looks great but one has to wonder with 1000’s of patients why not show a lot more of these type of results? » with 1000’s of patients why not show a lot more of these type of results? You raise a good point, and results, no doubt, will vary. But this is not an “old repost” because there is updated video of this patient that shows his hair today, and it looks better than in any previous videos. I would have to agree with diamond6. Seeing the same handful of patients over and over and over again is a red flag. Of course we like to see the updates, especially on the repair cases. But one has to wonder why we don’t see pictures of the rest of the patients. It’s only through constructive criticism that the doctors and industry can improve. But I also know some egos just can’t handle it. I think showing updates of BHT patients is very important. Some folks on the forums often wonder, “what ever happened to… so and so”. “Does body hair still grow years later after being transplanted?” Etc. Dr. Umar has been going to great lengths to follow up on some of his early BHT cases for all to see. I would imagine some of these patients are from other countries (or out of state) and getting them to visit the clinic for follow-up videos is problematic. As a BHT patient myself, I always like to see follow up videos and observe the BHT growth/texture/yield over time. Thank you for your responses to the post. By the way Diamond and Topcat, how is your respective hair transplant repair work with Dr Woods/Bisanga coming along? I wish you the best of luck to you and your doctors. We respect the fact that, given both your histories, you surely may have less than passing interest in the kind of work coming from our clinic. » interest in the kind of work coming from our clinic. Unfortunately maybe my post was misunderstood. Of course this is a very good result. With the thousands of patients that have had ht surgery performed, just a handful of patient results shown doesn’t quite cut it in my book and this includes all clinics. This is just my opinion and I am sharing it with the hope of helping others from making some of mistakes I have made. I also know that I have dealt with some doctors in the past whose egos were so huge that criticism is hard for them to accept. Thankfully I didn’t make the mistake of going to them. In this day and age patients have access to enough information where they should be able to make better decisions. This is why I often encourage others to both meet patients in person and speak to them over the phone. People tend to be more truthful when speaking to them personally then on the forums. I’m not quite sure why that happens to be. Maybe you have some thoughts on this. As I have said this is just my own personal opinion and posted only for the benefit of other prospective patients. My word is not gospel, but only something for others to think about before making their own personal decision. You are correct I do have more then a passing interest in what clinics are doing, but this includes all clinics. I think one only needs to look at my posting history for the last 12 years. I would like to think that my 25 years of experience as a patient in this industry and what I have seen can be useful to many. I have had no agenda over the years except to help others. Thank you for asking about my repair work with Dr. Bisanga. Everything is going very well. The healing was incredible and at this point I have close to 100% growth. The clinic was very caring and understanding and I am glad I took that first step. All the best and thank you for responding to my post. In hindsight maybe my initial response was inappropriate. It wasn’t my intention to redirect attention away from your result. I really do need to maybe be a bit more careful and start a new thread when expressing some of my opinions. Thank you for your interest in my case. I am very pleased with my results from Dr. Woods. I am told by family members and friends that I look 90% Better since my corrective surgery. I know in my heart that I made the right choice in going to him. I am going back for one last surgery later this year. I will have Dr. Woods post my video at that time. I just wonder though since we only see very few cases, why don’t we see more severe repair victims from all clinics? As topcat says the same ones dont’ cut it for me either. We need to see a whole lot more imo. "This is why I often encourage others to both meet patients in person and speak to them over the phone. People tend to be more truthful when speaking to them personally then on the forums. " Could not agree with you more. Good post! I totally understand and again thank you for your thoughtful posts and interest. You have made a good choice in a doctor. We truly wish you the best of luck. I am happy things are going well for you with your hair transplant. Again you made a good choice. Just so you know, we have several more repair cases on our website, http://www.DermhairClinic.com. Over 50% of Dr Umar’s patients are actually repair cases, and the majority are exceedingly happy and have commented that they had their lives transformed after Dr. Umar’s surgery. He has received letters from family members and friends reiterating how Dr. Umar’s hair transplant repairs have transformed the lives of their loved ones. What we find fascinating is that not only is the patient happy after their procedure, but their happiness apparently filters through to those around them in the most positive of ways. Please do note, not all patients are open to sharing their results, and we can only post those that are willing to do so. A few are also open to coming for periodic follow ups, and to those patients, we remain grateful. The patient in this current thread has had 2 previous videos, each done at a 1 year interval. Each video shows significant improvement from the one before it, which is something we take pride in. Worst Case hair transplant repair Performed by UGraft : Dr U perfroms yet another miraculous repair using his signature UGraft advanced FUE. I have had the opportunity to speak to several of your patients in the past, but none from this list. I have found speaking to patients in person has always been very valuable. Are any of the patients on this list available to speak with either in person or by phone about their experience? I’m always available to talk on the phone or meet in person here in LA. Hi Sofar, we have exchange PM’s and I know that you are quite happy with your work to date. I’m was just commenting on the list that was posted. It wasn’t meant in a negative light. I just think that it’s important for patients to at the very least speak to patients on the phone as opposed to just reading the forums. I think that we both would agree this is essential in the decision making process at least it was for me. I have already chosen the clinic that is right for me. This is just to help educate others. Which is probably the whole point of posting as we have both gone down some long roads in the HT business. I think we both feel the need to help others as a moral obligation and that’s a good thing. I’m sure this patient is quite happy with his result. Happy growing to you Topcat! Looking forward to meeting you in person someday and share HT “war stories”. If you are even in LA… first round is on me.